Pay close attention to the % of American adults who subscribe to Cable TV and Netflix. In particular, notice the 18-36 age category. 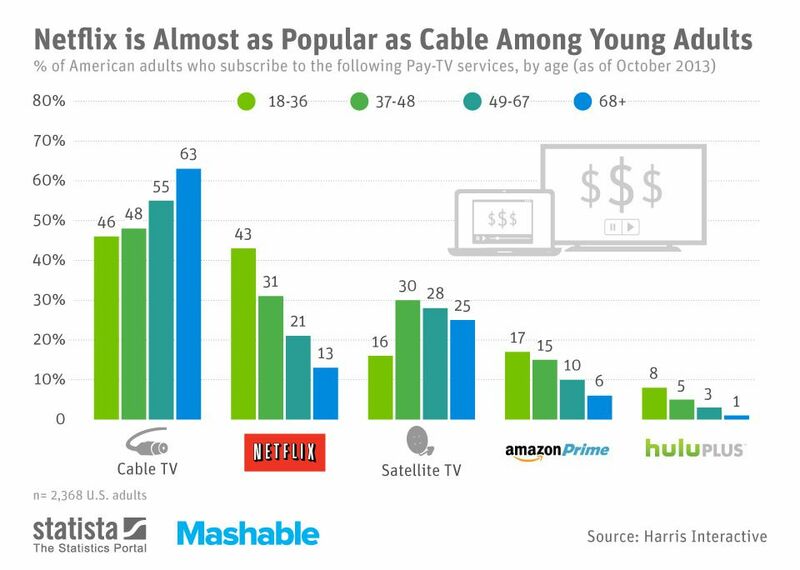 For cable TV, 46% of this age group subscribes and for Netflix, 43% of this age group subscribes. The difference is negligible. We can also look at the subscription rates for satellite TV (16%) and then two other online sources: Amazon Prime (17%) and Hulu Plus (8%). No doubt, some of the folks who subscribe to Cable TV may also subscribe to Netflix and other online sources, but it seems pretty clear where the trend is headed. In fact, if we look back at the Cable TV subscription rates across all age groups, we see a sloping line from the bottom left to the top right. If you’ll notice, there’s a decided decrease in Cable TV subscription rates from the older age groups to the lower age groups. Similarly, there’s the inverse relationship when we look at online places like Netflix and Amazon Prime. There’s a decided increase as you get into the lower age groups.